(CNN) -- A Texas inmate in a wheelchair, who escaped on foot from two armed guards as he was being transferred between prisons, is now on the U.S. Marshals' list of the 15 most-wanted fugitives. Arcade Comeaux Jr., 49, "produced a weapon and fired upon two correctional officers, took them hostage and forced them to drive to Baytown, Texas," the U.S. Marshals Service said in a statement. He then put the officers in the back of the van and took their weapons and one of their uniforms, the statement said. Comeaux was serving three life sentences for aggravated sexual assault and two counts of aggravated assault with a deadly weapon. He escaped Monday during transport from Huntsville, Texas, to Stiles, Texas. The 6-foot, 200-pound man was shackled and in a wheelchair, "which he had claimed was needed for mobility," Michelle Lyons, director of public information for the Texas Department of Criminal Justice in Huntsville, said in a statement. About 45 minutes into the trip, as they were driving through Conroe, 40 minutes north of Houston, the prisoner pulled out a pistol and ordered the guards to drive south to Baytown, east of Houston. 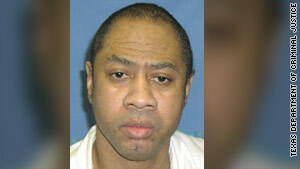 He fired once, but hit no one during the escape about 9 a.m., officials said. Law enforcement officers found the unharmed officers an hour later. Comeaux was being transferred so he could be near John Sealy Hospital in Galveston for treatment of the supposed paralysis he had suffered during a reported stroke, officials said. At least $16,000 in reward money has been offered for information leading to Comeaux's rearrest and a task force of more than 100 investigators is searching for him, focusing on the Houston area, where he grew up and has family. His escape has led the man who oversees Texas' criminal justice system to call for a shakeup of the prison system. "I just think enough's enough," said Sen. John Whitmire, the Texas Democrat from Houston who is chairman of the state Senate's Criminal Justice Committee. "We need a complete shakeup of the leadership of our prison system and/or an outside review by third parties," he told CNN by phone Wednesday. "We just can't have security breaches of this nature." Whitmire said the guards had failed to pat down Comeaux while he was in his wheelchair and before they began the trip. "Sure enough, he has a firearm," he said. "The question is, are there others (in the prison system)? I think you have to assume that there are until you find out differently." So far this year, more than 900 cell phones have been confiscated from the 112 locations that house the state's 158,000 prisoners. "It's pretty rampant," he said. "I want the director to come forward and tell us what it's going to take" to solve the problem, he said. John Moriarty, inspector general of the Texas Department of Criminal Justice, said such lapses are highly unusual in the state's penal system. "We have no open gun investigations other than this one," he said. "The last one was several years ago." Texas Department of Criminal Justice Executive Director Brad Livingston, who has been in the job since 2005, did not immediately respond to a call seeking comment.